Not everyone loves trains the way I do. The sign can be seen on trailers in the industrial park near where I work in the Bay Area. 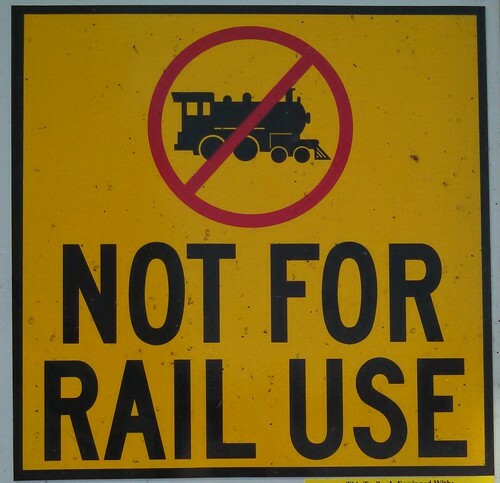 It means that the trailer must not be loaded on intermodal rail equipment because it's not built to handle the higher loads encountered in rail service. I find it amusing that whoever designed the sign decided to use a steam locomotive to indicate a train. As it happens, there has been at least one case of Union Pacific steam hauling an intermodal freight, when the UP Steam Team were taking one of their steamers out for a shakedown run after repairs. The Steam Team likes to pull their weight, and it's best for the locomotive to run under load, so when there happened to be a train coming through Cheyenne needing a crew change, they tacked on the steamer and took it up the line. I wish I'd seen that one. As with most of my photos, this one is CC-licensed if you want it. I shot it while out taking a walk after lunch. It turns out that per my pedometer, one lap around the logistics park in which I work is about 2 km.